Providing you the best range of donracks mezzanine floors with effective & timely delivery. Mezzanine Floors are raised platforms that are constructed and supported by steel columns and are completely independent of the infrastructure of the building. 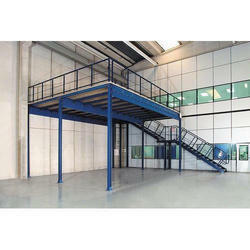 Mezzanine floors help in adding floor space to empty airspace. This helps to save costs on additional premises but helps in putting to best use the cubic volume of the existing space in the building. Mezzanine floors are the inexpensive solution to help expand the floor area of the premises vertically. We offer the best in quality steel for the construction of these columns. There are plenty of advantages that can be listed out on the use of mezzanine floors; one of the best to note is that in most cases this may not need the permission of authorities in spite of it offering additional floor space. We offer mezzanine floors that are completely customized to suit the need and requirement of the organization's specific needs without compromising the safety and stability of the storage solution. It comprises a wide range of floor surfaces and is offered in plenty of sizes as per the premises. Mezzanine floors can be integrated with other storing applications. It is capable of offering storage utilities such as shelves and racks or can be used as additional office space, production space, and retail space. Heavy machinery can also be stored in mezzanine levels. Mezzanine floors from us are made from premier quality steel that is powder coated and manufactured to exacting standards that promises the highest quality deliverance. Mezzanine floors are easy to install and comprises of a nut and bolt assembly. It is also possible to add an extra storage level to an existing mezzanine framework. The framework can also be dismantled, modified and moved as per the requirement of the organization. The mezzanine flooring projects from We are delivered to an agreed installation design and framework in time without hindering the day to day operations of the business.